We couldn't wait to get this up for you. This week we have our raw, unedited thoughts on the 50th Anniversary special, "The Day of the Doctor". No news, no feedback...and amazingly very little rabbit chasing. Just gushing and squeeing and loving this best of all anniversary episodes. WARNING: Massive spoilers. If you haven't seen "The Day of the Doctor" yet, don't listen to this show until you do. We're tuning it up to 11 this week. It's time for us to take a look at the Eleventh Doctor and the story "Victory of the Daleks". We also seem to be in the midst of a rabbit invasion, so watch your step. There's also a bit of time traveling as our future selves pop in to review "The Night of the Doctor" that exploded onto the internet after we recorded this show. Beneath the motorway is something that keeps eating cars. Usually, it's a pothole. In "Gridlock" it's a plothole. Oh, Russell T. Davies wants us to think it's the Macra, but we know better. This week on the next to last stop on the Road Trip to the 50th Anniversary we attempt to fill in these plotholes and give you a look at the Tenth Doctor story "Gridlock". About "Lord of Cragsclaw" by Bill Fawcett, the book with the Mrem. Our journey on the Road Trip to the 50th Anniversary is almost over. 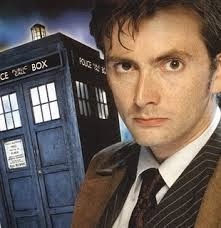 We have arrived at the next to last stop with the Tenth Doctor, David Tennant. But we don't need to get all emotional about it, the Tenth Doctor will do that for us.